On live television, Venezuelan Vice-President Nicolás Maduro choked on his words. Hugo Chávez, the improbable President, born in the rural poverty of Sabaneta, in the state of Barinas, in 1954 had died of cancer. To his wealthy and light-skinned enemies he was evil incarnate. To many impoverished Venezuelans, his contradictory and eclectic ideology – a labyrinthine blend drawing on the thought of nineteenth century Simón Bolívar and Ezequiel Zamora, twentieth century left-military nationalism and anti-imperialism, Soviet-inflected, bureaucratic Cuban Socialism, social Christianity, pragmatic neostructuralist economics, and currents of socialism-from-below – made a good deal of sense at least insofar as he had come from origins like theirs and had made the right sort of enemies. For sound reasons, the international legacy of the Venezuelan president for sections of the left has been tarnished by his appalling support of Gadhafi, al-Assad, Ahmadinejad, and the Chinese state. But to begin there for an understanding of the profound resonance of his death for the millions upon millions of Venezuelan and Latin American victims of colonial rule, capitalist exploitation, and imperial humiliation would be to resolutely miss the point. There’s something about Chávez that encourages a starker-than-usual embrace of mediocrity in the quarters of the establishment press. How else to explain the appeal of Rory Carroll, whose dystopic fantasies about the life and times of Venezuela since 1999 have found their unmitigated expression in the pages of the Guardian, New York Times, and New Statesman, among others, over the last few weeks. For Carroll, the Venezuelan popular classes have been the mute and manipulable playthings of the “elected autocrat,” whose life in turn is reducible to one part clown, one part monster. If we once imagined that Chávez emerged out of the debauched embrace of neoliberalism by an old rotating political elite ensconced in the traditional AD and COPEI parties in the late 1980s and early 1990s, the concomitant socio-political fissures created by the popular explosion of anti-neoliberal sentiment during the caracazo riots of 1989, and the folkloric rise of a dissident military man to the status of popular hero though a failed coup attempt of 1992 (targeting the status quo), we now stand corrected. The idea that Chávez is the result of Chavismo – a pervasive groundswell of demands for social change, national liberation and deeper democracy – becomes a fraud. “We Created Chávez!” – a popular delusion. We are to understand from this that contemporary liberal democracy is the selection of good managers. A proper manager for the twenty-first century is presumably something closer to the pliant figure of unelected free-market Italian technocrat Mario Monti, whose loss in the recent Italian elections was mourned by the same media outlets demonizing Chávez. The Economist spoke of the stubborn Italian electorate’s “refusal to recognise the underlying causes of Italy’s plight” achieving its full expression in “their refusal to back Mr Monti.” The tidal wave of anti-Chávez vitriol on behalf of the world’s rulers is rooted in the refusal he represents for the poor and dispossessed, for the exploited and oppressed – a refusal to go on as before, to submit to neoliberal capitalism, and to get on one’s knees before imperialism. It’s true, in other words, that he made an awful manager. On March 7, 2013, the conservative opposition media reported “hundreds of thousands” in the streets of Caracas mourning their manager’s demise. An editorial in the Mexican daily La Jornada speaks of “millions.” A quick search of Google images and Youtube produces a veritable red tide of mourners. Through Carroll’s prism these multitudes must radically misunderstand the legacy of 14 years of Chávez: “the decay, dysfunction and blight that afflict the economy and every state institution.” They must misconceive the “profound uncertainty” the late president has thrust them into. They must be blind to the “bureaucratic malaise and corruption” surrounding them. Mark Weisbrot, a social-democratic economist based in the United States, once complained that Venezuela “is probably the most lied-about country in the world.” In fourteen years Chávez won fourteen national electoral contests of different varieties, coming out securely on top of thirteen of them. According to Jimmy Carter, former US President, Nobel Prize winner, and monitor of ninety-two elections worldwide in his capacity as director of the Carter Centre, these Venezuelan contests were the “best in the world.” In the 2006 presidential race, it was opposition candidate Manuel Rosales who engaged in petty bids of clientelism aimed at securing the votes of the poor. Most notoriously, he offered $US 450 per month to 3 million impoverished Venezuelans on personal black credit cards as part of a plan called Mi Negra. In what his right-wing critics could only understand as a rare act of agency, the ungrateful would-be recipients apparently aligned themselves on the other side of history, backing Chávez with 62 percent of the vote. The “suppressed media” mantra is another favourite go-to card of the opposition. In one representative report, the US-based Committee to Protect Journalists claimed that the heavy hand of the Chávez government wielded control over a “media empire.” In actual fact, Venezuelan state TV reaches “only about 5-8% of the country’s audience. Of course, Chávez can interrupt normal programming with his speeches (under a law that predates his administration), and regularly does so. But the opposition still has most of the media, including radio and print media – not to mention most of the wealth and income of the country.” Walking the downtown streets of the capital in the lead up to the presidential elections of October 2012, with billboards of right-wing candidate Henrique Capriles Radonski hanging from the lampposts, and Kiosks overflowing with newspapers beaming headlines on the latest disaster induced by the Chávez regime, even the most spiritual of journalists would strain in vain to find a ghost of Stalin in Caracas. At its root, explaining support for Chávez among the lower orders involves neither the complexity of quantum mechanics nor the pop-psychological theory of masses entranced by a charismatic leader. Venezuela sits on oil. Other petro-states, such as those in the Gulf, have funnelled the rent into a grotesque pageantry of the rich – skyscrapers, theme parks, and artificial archipelagos – built on the backs of indentured South Asian migrant labourers. They’ve done so, moreover, while aligning geopolitically with the US Empire – backing the wars, and containing the Arab uprisings. Much to the bizarre dismay of journalists like Ian James, the Venezuelan state in the last fourteen years has been forced into different priorities. After recovering from the steep collapse in gross domestic product (GDP) in 2002 and 2003 – hitting -8.9 and -7.8 percent respectively as a consequence of political crisis spurred by an unsuccessful coup attempt and business-led oil lockout – GDP soared on high petroleum prices to 18.3, 10.3, 9.9, and 8.2 percent in the years 2004-2007. There was a drop to 4.8 percent in 2008 as the international oil price took a fourth-quarter plunge from $US 118 to $58 a barrel due to centrifigual waves of the global crisis spreading out from its American and Eurozone epicentres. Within six months, however, world oil prices had largely recovered, and countercyclical spending brought the Venezuelan economy up to 4.2 percent growth in 2011 and 5.6 in 2012. After the relative modesty of state policy between 1999 and 2002, the extra-legal whip of the Right lit a fire of self-organization in the poor urban barrios of Caracas and elsewhere. The empty shell of Chávez’s electoral coalition in the early years began to be filled out and driven forward in dialectical relation to the spike in organizational capacity from below in the years immediately following 2003. New forms of popular assembly, rank-and-file efforts in the labour movement, experiments in workers’ control, communal councils, and communes increasingly gave Venezuelan democracy life and body for the first time in decades, perhaps ever. The dispossessed were solidly aligned with Chávez in opposition to the domestic escualidos (the squalid ones who supported the coup), and ranged against the multifaceted machinations of US intervention and the pressures of international capital; but they were also rapidly transcending the timid confines of government policy. From above, more state resources consequently began to flow, feeding an expanding array of parallel health and education systems for the poor. According to official national statistics, the cash income poverty level fell 37.6 percent under Chávez, from 42.8 percent of households in 1999 to 26.7 percent in 2012. Extreme poverty dropped 57.8 percent, from 16.6 to 7 percent between 1999 and 2011. If these income poverty measures are expanded to include welfare improvements from the doubling in college enrolment since 2004, new access to health care for millions, and extensive housing subsidies for the poor, it is easy to see how Carroll’s narrative of decay breaks down. This backdrop in its entirety provides a reasoned explanation for the red tide of mourners. But it doesn’t explain the challenges ahead, and a socialist Left that stops here cedes unnecessary ground to thermidorian reaction. Assuming Maduro’s victory over the right in forthcoming elections, the pragmatic balancing of contradictory elements within the Bolivarian process that Chávez managed to sustain is likely to be much more difficult. The game, ultimately, is not a virtuous circle of mutuality, but a zero-sum competition of classes with opposing interests. The lubricant of oil has blurred this reality temporarily, but different developmental exits in which distinct classes win and lose are likely to come to the fore relatively quickly. The conservative chavista right within the state apparatus, the currents of reaction inside the military, the red bureaucrats enriching themselves through manipulation of markets, and the union bureaucrats aligned against working-class self-organization and emancipation are the preeminent obstacles of immediate concern. At the same time, the experiences of workers’ control, communal councils, communes, and popular assemblies have raised the consciousness and capacities of millions. A dire turn is therefore not a fait accompli. 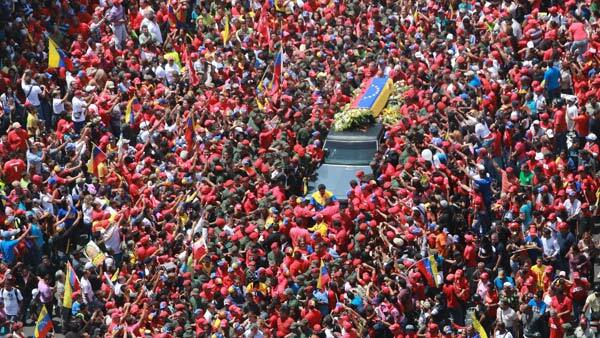 Today we mourn the death of Chávez, tomorrow we return to the grind for socialism.